Blowout Sale! Save 53% on the Solar Charger Friengood 15000mAh Portable Solar Power Bank Dual USB Ports Solar Phone Battery Charger with 6 LED Flashlight Light for iPhone, iPad, Samsung and More (Orange) by Friengood at Got Busted Mobile. MPN: 888-orange. Hurry! Limited time offer. Offer valid only while supplies last. Friengood 15000mAh Portable Solar Phone Charger, Power Your Life! Outdoor necessitiesMade of durable material, shock proof and dust resistant. Friengood 15000mAh Portable Solar Phone Charger, Power Your Life! Made of durable material, shock proof and dust resistant. Battery comes with a hook so you can simply attach it to your backpack when in outdoor and it will soak up energy from sun. 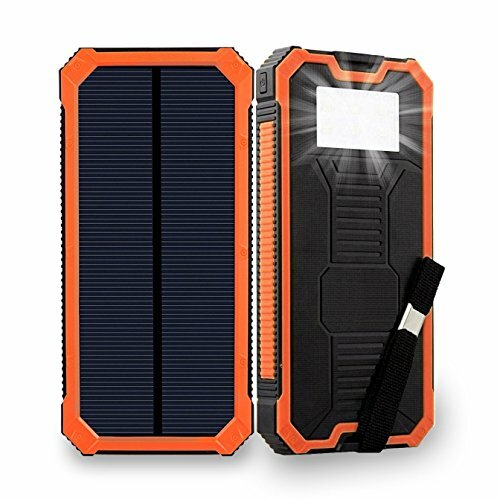 This solar power bank is a necessity for your outdoor activities. Build-in Lithium Polymer battery cells, short-circuit and over current protection, device will automatically shut down when short circuit or overload output happened, avoiding the destroy of device and accident. It can charge iPhone, iPad, iPod, Samsung, Android phones, PSP, digital camera, bluetooth speaker and other USB devices. ❥Please charge it via outlet at least 10 hours at first time use to fully activate this solar charger. ❥Due to sunlight intensity and small surface area of the solar panel, it will take a long time to fully charge this power bank. The solar feature is designed as an emergency back-up. In daily life, please charge it via outlet for better use. ☀HIGH CAPACITY - Built-in 15000mAh Li-polymer battery. This portable charger can charge an iPhone 8 for 4 times, Galaxy S8 for 3 times, iPad for 1.5 times if the battery has full power. Provide enough juice for your electronic gadgets. ☀DUAL USB OUTPUT PORTS - Can fast charge two devices simultaneously. Auto detects your device to deliver its fast charge speed. 2A port for iPad/Tablets, 1A ports for cell phone/ Bluetooth or other 5V USB supported devices. ☀PRACTICAL LED FLASHLIGHT - Built-in bright 6 LED can be used as a torch, or as an emergency lighting in darkness. Just press the button twice, the LED will light up; press once again, the LED will flashing as SOS mode. ☀UNIVERSAL DEVICE COMPATIBILITY - This solar power bank is widely suitable for iPhone, iPad, iPod, Samsung, LG, Nexus, HTC, Gopro Camera, Bluetooth speaker and other USB devices. ☀SOLID & PORTABLE DESIGN - The out case is made from durable ABS + PC material, shock proof and dust resistant. At the same time, with a compact size, you can easy to hold in hand and carry. Perfect for outdoor activities. If you have any questions about this product by Friengood, contact us by completing and submitting the form below. If you are looking for a specif part number, please include it with your message.